Kungliga Tekniska Högskolan (KTH) Royal Institute of Technology is the oldest university in Sweden and focuses on technical research and engineering education. 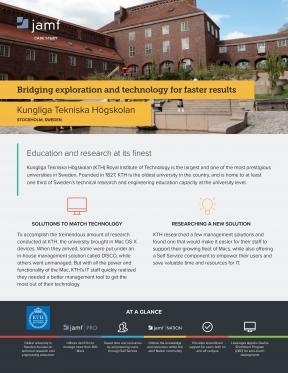 To accomplish the tremendous amount of research conducted at KTH, the university brought in macOS devices and chose Jamf Pro to deliver a streamline support, hence empowering their users. Providing streamlined support for users — both on and off campus.